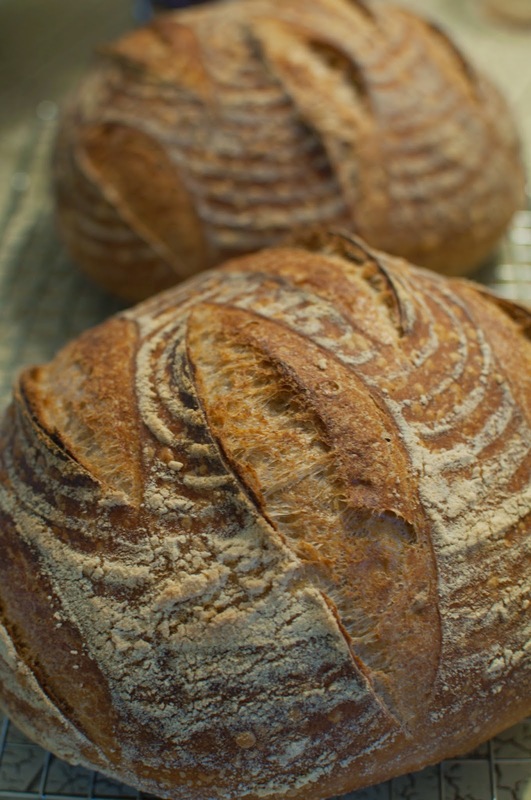 It's the last week of the first month of the bread share, and as a thank you to the charter members of the share, we're throwing in a little something extra; the lagniappe. I was always familiar with the concept...the little something extra, a thank you of sorts. The "baker's dozen," for example. But I never knew it had a name until I got to the end of Ken Forkish's book "Flour, Water, Salt, Yeast," where Ken describes the concept, more of which can be read here. I don't even know how to correctly pronounce the word, but I like it. When I tried to think of something that everyone would like, the first thing that came to mind was cheese crackers. I admit it, I'm a big fan of CHEEZ-IT crackers. They have powered me up (and been the reward atop) many a mountain. They're great food for climbing and hiking; lots of carbs, fat, and salt. But they could be better. I've made probably a couple dozen batches of these crackers, a variation on the theme that can be found on Joy the Baker's site here, and on Chef John's blog here. These are a truly simple food. Cheese, flour, butter, spices, a drop or two of water. 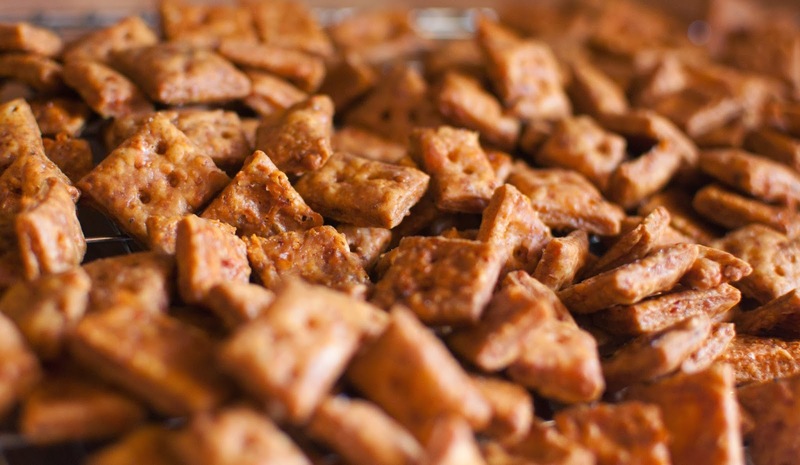 Quality ingredients are only half the battle though, as like biscuits, good crackers are mostly all in the method. Hard living outside the Chimayo store. I used three cheeses this time, extra sharp cheddar, longhorn colby, and asiago. You can use whatever you want. You'll probably notice a little kick in the crackers! That's from one of the spices, a ground chili from a trip I took with my friend Amy to New Mexico that included a visit to Chimayo, a place famous enough for its chiles that it has chiles named after it. If you find yourself in New Mexico with some time to kill, Chimayo is a great place to visit, not only for it's chili peppers but for the Santuario de Chimayo, a Catholic church which has a small room where people can pick up a sample of holy dirt (no joke) which has been known to cure all manners of ailments. The walls of the little room are adorned with dozens of pairs of crutches, which I have to assume were left there by people who were cured by the holy dirt. Santuario de Chimayo is also a destination for penitentes, who crawl there from great distances. It's a crazy world. 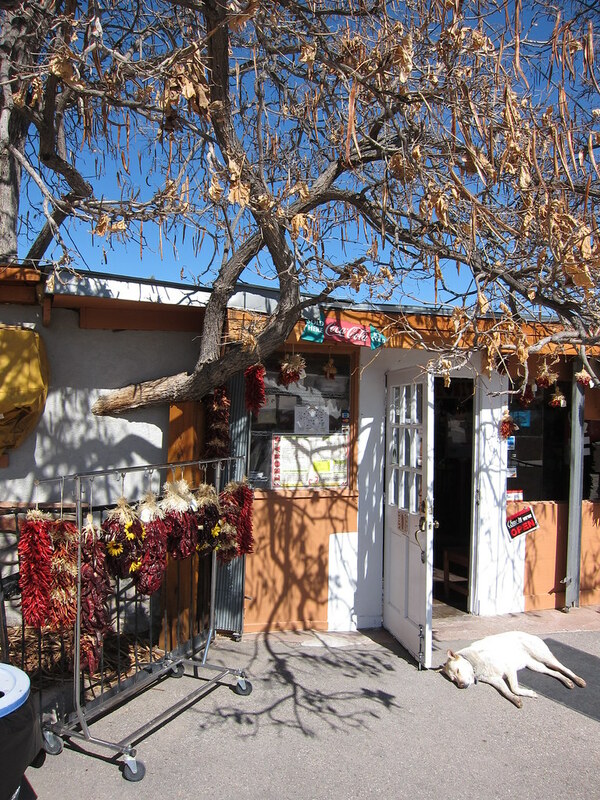 But the chili pepper is delicious, and has lost most of its bite in the couple of years since we were in Chimayo. Don't throw away "old" spices. They're not what they used to be, perhaps, but what they are is something different that flavors your food in a unique way. Try it. 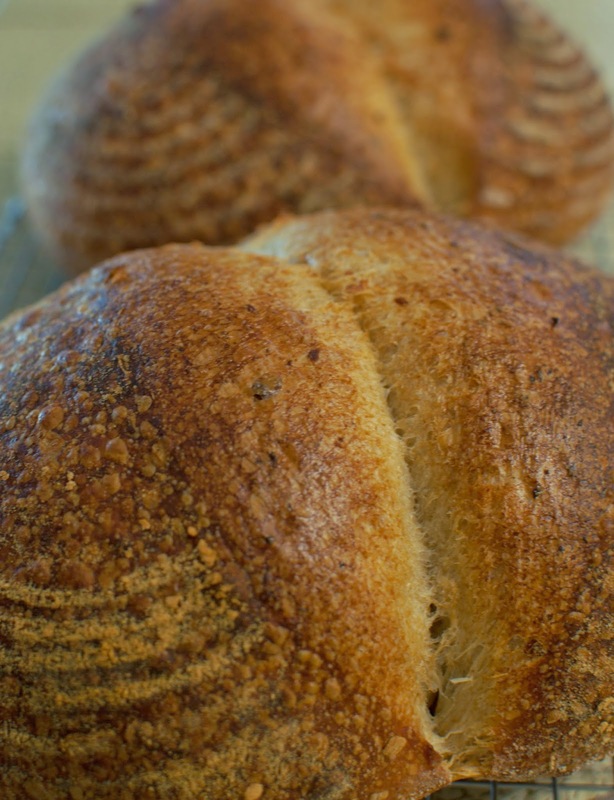 We've come full-circle to the Country Loaf here, and we certainly hope that you enjoy this loaf, since, really, we plan to make it more often than others, despite the variety so far. Time has been tight for trying out new loaves, but there's a Sesame Seeded 3-Day Mild Levain in the works. Not there yet, but it's close. 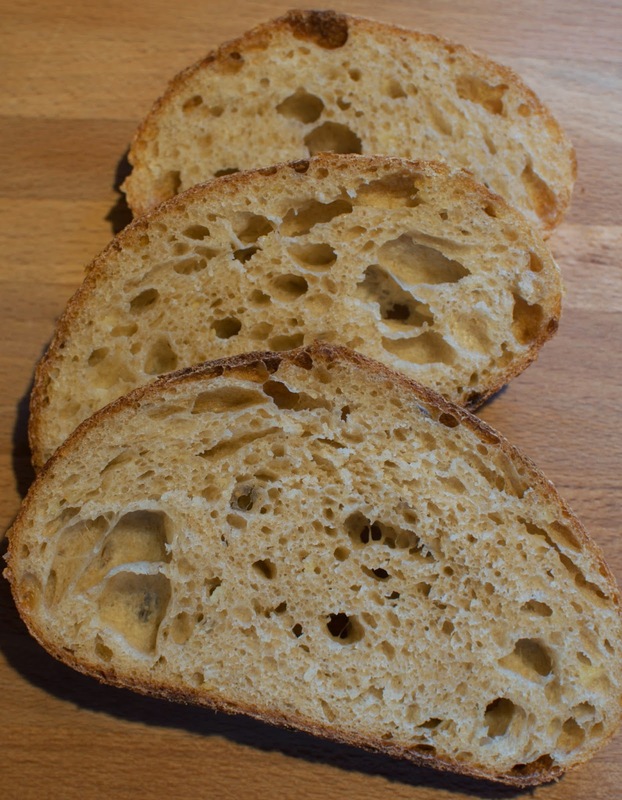 Here's a picture of the crumb from the latest version. This is going to need a bit more work, but it's promising. A nice loaf, but a significant departure from our plan to work as much whole grain into the bread as is palatable. It's certainly a pretty loaf though, and tasty. Last week's roasted potato and onion bread inspired us to make our first hamburger buns, mostly because we fired up the smoker and cooked up a shoulder for making pulled pork, and it just seemed like it would be better on homemade buns. It was. The buns were a little dense, but they were a nice, understated platform for what turned out to be the best pulled pork I've ever made. What a treat! We also cooked up some thrice-cooked french fries (parboiled, parfried, then fried) that are pretty much one of the most amazing food items you'll ever have, to be eaten infrequently of course. We whipped up a chipotle garlic aioli for dipping the fries and a Carolina BBQ sauce for the sandwiches, and coupled with a really nice cole slaw that Cam put together, we had us an old-fashioned feast. I didn't manage to get a photo of the whole feast assembled, but even the leftovers look tasty, as you can see in this photo from the next day's lunch. That makes me hungry just looking at it. Ha! And here's a preview of Wednesday's loaves, having their bench rest before final shaping. Such potential! Busy Week, Roasted Potato and Onion Fendu, More Pizza! Gads! It's been a hectic week here at C&C! Normally, I like to get something up there to let the bread share know what to expect, but I got busy this weekend, climbing with Rob and Thad, working on the house, and testing out a variation on the Roasted Potato Fendu we made a few weeks ago. Pretty exciting stuff! This week's loaf, the Roasted Potato and Onion Fendu has been a hit, at least if the early reviews are any indication. In keeping with the first two loaves, this one has a portion of whole grains that we milled ourselves. This loaf also incorporates some local ingredients. There's a good portion of Redlands-grown Yukon Gold potatoes from Jacinto Farms, and just a touch of oven-roasted onions from our own garden. I built this formula from some ideas gleaned from other formulas, but adding the onion was a bit of a challenge because I didn't was to overpower the bread with onion flavors. That would be fine if this were a pull-apart roll or something meant to be consumed by itself or with a little butter. It's a good loaf for that, but with the mild onion flavor, it's also excellent for what potato bread is best for (in my opinion); sandwiches. 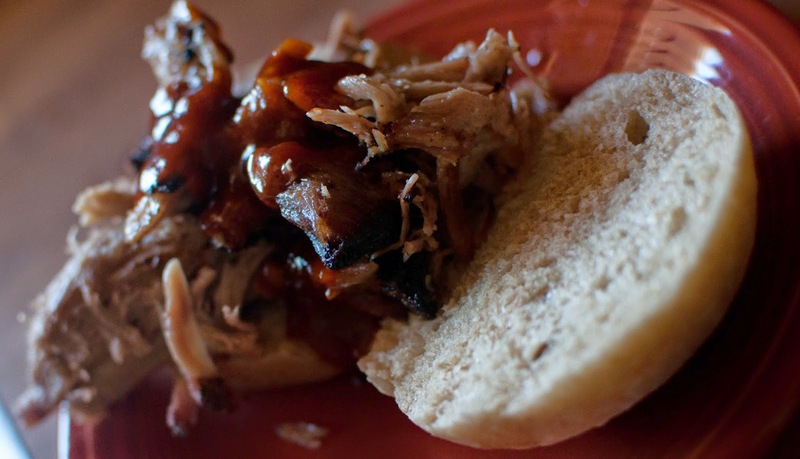 Most sandwich breads have ingredients in them to condition the dough and make it softer. This is usually some sort of fat or milk. Potato accomplishes the same thing (almost) while still leaving the loaf "lean," as there is nearly no added fat, just the tiny bit of olive oil that the onions and potatoes are coated with for roasting. The crust, you'll find, is more tender than the toothy crust you normally expect of an artisan bread. This loaf is nicely shaped as a fendu (which I guess is French for "split" or "cleaved"). A fendu isn't scored before it goes in the oven. Instead, the formed loaf is split nearly in half by pressing a floured rolling pin right into the middle of the loaf. After proofing upside-down in a banneton, the resulting loaf spreads when it springs in the oven, resulting in a unique loaf that cuts up nicely into sandwich slices or toast. Last night we had pizza with a friend (and Cam's former student). 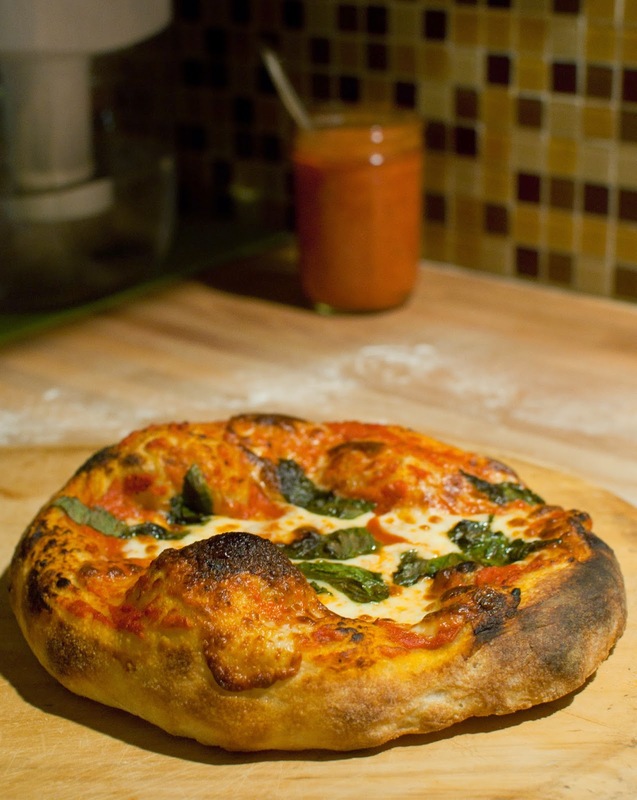 It's not got anything to do with the bread share, but I can't resist sharing pictures of these delicious all-sourdough margherita pizzas. This week's loaves are coming out particularly well. Yesterday's four Ryes had a very pretty oven spring, I though. Here's a picture. Jewish Deli Rye. Look at those ears! So what do you do with your loaf? I really, really like this bread toasted. If you're looking to make a classic pastrami sandwich, I recommend using the approach detailed here, and I'll reproduce it below, verbatim, after sharing a picture of the sandwich I just enjoyed for lunch. 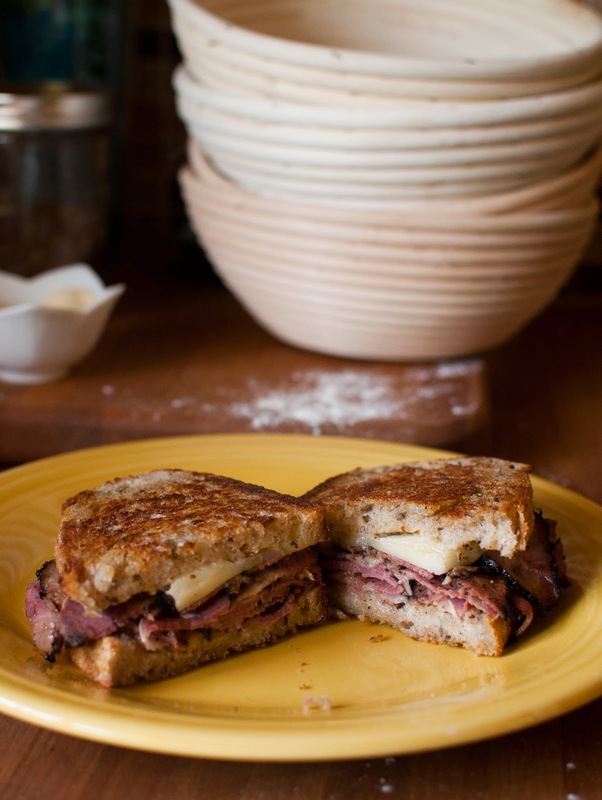 Pastrami on Rye with Provolone and Spicy Mayo. Mix mayonnaise, honey mustard, horseradish and black pepper in a small bowl and set aside. For the sandwich, smooth on the spicy mayonnaise, then layer on provolone cheese and meat. Top with other slice. Melt a small pat of butter in a warm skillet, then place sandwich in skillet to warm, flipping once. Remove from heat when cheese is melted, slice in half, and serve. I might have a heart attack before the end of the day today, but at least I'll have had a good lunch! Sometimes it hits on all eight cylinders. I'm pretty sure our original plan was to stick to one particular loaf of bread at the beginning of the bread share. It sounded like a good idea, then I hit on a couple of nice loaves that I thought would be a good fit. One is a nice Jewish Deli Rye Boule with caraway seeds, the other a Roasted Potato Fendu. So this week it'll be the rye. I talk a bit about this loaf in this post last month. It was a bit of a gamble, as I was heavily modifying a formula from Hamelman, but it worked, at least in my opinion. This loaf makes exceptional toast. I hope you all enjoy it. As with week one's loaf, this is 100% natural levain, no comercial yeast. It's about 15% whole organic rye berries that we mill ourselves, and the rest is unbleached white flour, with some pacific sea salt (from California) and just enough caraway seeds. Not too many! Oh, and though tasty, the 100% Whole Wheat loaf that we baked this morning won't be featured in this posting. One photo of a flat-itsh dense loaf a week is enough. I sincerely hope that everyone enjoyed week one's offering. That loaf is one I've been working on for a long time, and I think that it's tasty, hearty, healthy, and wheaty without being too over the top. As always, be sure to let me know if there's something about the loaf you'd improve. Week two! Here we go! It's Saturday, and we're giving a couple of formulas a try. Nothing too radical, but definitely treading in potential brick territory. I really, really like the "Jewish Deli Rye" that we've made a few times, and I don't want to mess with success, but there's only about 15% rye flour in that loaf. Enough for a bit of flavor, but not enough to really impact the texture and character of the loaf; most of the flour is wheat flour, so the bread's structure is predictably light. 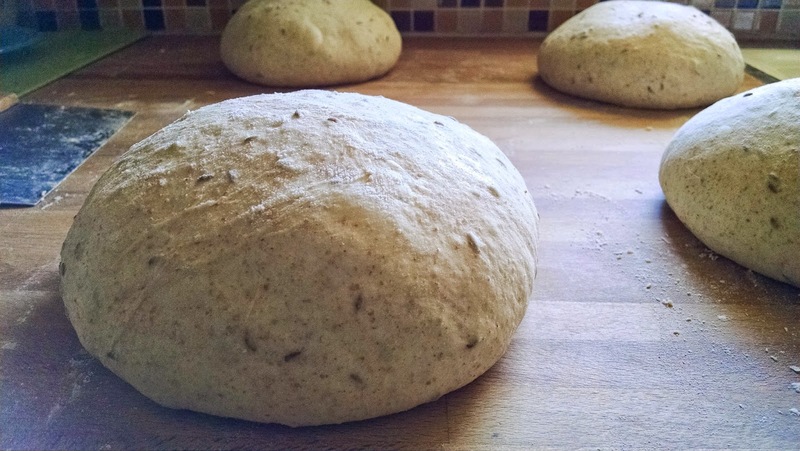 As you increase the percentage of rye flour in the loaf, you get less and less gluten to support the structure of the dough, and the loaf gets gradually less airy and light until you get to 100% rye, which produces those square, dense blocks of pumpernickel. I supposed I could make those, but it's not what I'm shooting for. Instead, we basically tripled the amount of freshly-milled whole organic rye flour, since 40% is a respectable amount of rye flour, but there's still enough wheat flour in there to keep things lively. The loaves came out okay. Compare the crumb of this loaf with the deli rye we made a couple of weeks ago. No contest. Tomorrow will be a 100% Whole Wheat, made entirely with hard red winter wheat that we milled this morning in the Nutrimill. It promises to be a real brick. I'll have a full report tomorrow, probably with pictures of a loaf that could anchor a large container ship. That's what weekends are for! What do I do with this big loaf of bread?! I certainly suffered similar anxieties when I started baking. You'll find a lot of conflicting information out there about how best to preserve a loaf of bread. 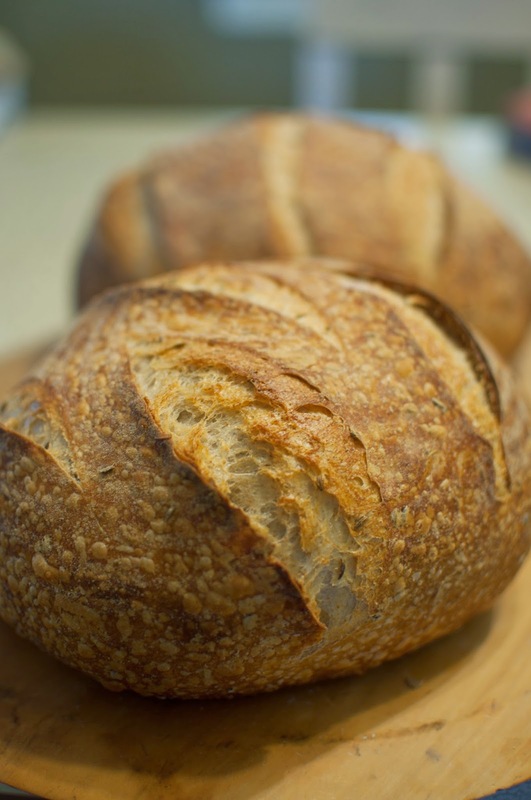 Recipients of our bread are ahead of the curve without even trying; our breads are naturally leavened. 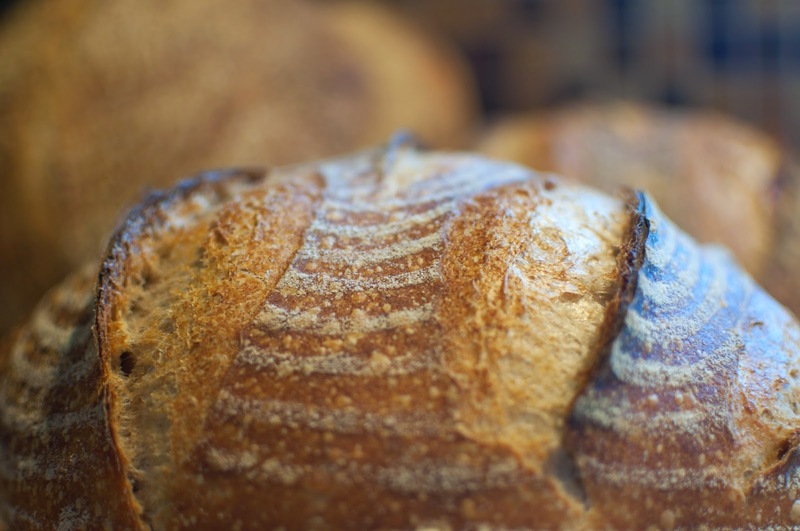 A natural levain (sourdough) isn't just yeast, it's beneficial bacteria that live in a symbiotic relationship with the yeasts, which, incidentally, aren't even the same strain of yeast that you get in commercial yeast (instant, active dry, etc.). Among other things, the bacteria produce lactic and ascetic acid. These acids act as a natural preservative, extending the life of your loaf. In fact, if you don't cut into it, you can just leave it on the counter in the paper bag it's delivered in for two or three days. The crust won't be the same as on day one, but the crumb will fare well. In fact, some picky bakers actually argue that these sourdough loaves aren't really good until they've had a couple of days to mature. Lionel Poilane, whose miche was (and is) considered by many to be the ultimate expression of the boulager's art, believed that his larger boules weren't at their prime until they were three days old. I wouldn't recommend waiting three days to eat your bread. Instead, after years of trying different approaches, I've settled on this... The day the loaf is baked, I'll usually cut a quarter of the loaf and enjoy it that day. No need to heat it or toast it. In fact, I often don't even put anything on it. It's great just plain. If I know that on the second day a lot of the loaf will be eaten, I just stand it on the cut side on the cutting board. That protects the exposed crumb from drying out. The crust will get a bit more toothy, but it will be fine for a second day. On the second day (or the first, if I know only a couple of slices a day will be eaten) I slice the entire loaf into 1/2 to 3/4 inch slices, re-assemble the loaf, slide it into a gallon ziploc bag, and toss the whole thing in the freezer. The first time you go for a slice to make toast, a sandwich, etc., just take the loaf from the freezer and smack it on the counter. This will separate the slices. You'll find that these slices will be as fresh as the day they were baked! Try taking a couple of slices from the freezer and putting them in the toaster just long enough to mostly thaw them. Butter one side of each slice, put some thick slices of quality sharp cheddar between the two slices, and toast them in a hot frying pan (butter side out, of course) for the best grilled cheese you ever had. Don't freeze the whole loaf or big chunks of the loaf unless you plan to consume them all at once at the time you thaw them. That said, if you have an occasion some days after you receive your loaf and would like to save it for that occasion, simply freeze the whole loaf in a ziploc bag. The day of your occasion, take the loaf from the freezer 8 hours before you need it, then give it 15 minutes or so in a 400 degree oven if you'd like to crisp the crust back up before serving. Always give the loaf 15 minutes or so after heating it like this before cutting or serving it. You don't actually need to cut the loaf. You can just tear hunks of it off and eat them, or dip them in a plate of olive oil and black pepper, garlic, or olive oil with a puddle of balsamic vinegar in the middle. Fantastic. 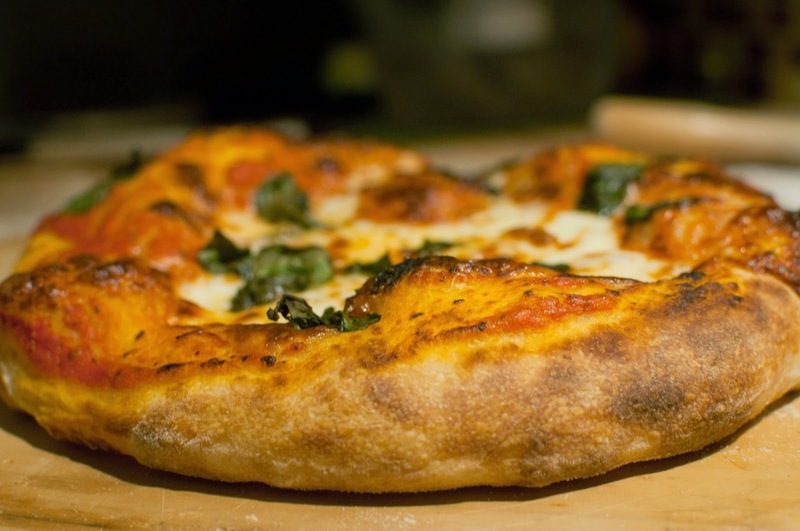 Most of the time, though, you're going to want slices. Slicing a big loaf into 1/2 inch slices takes practice. Don't handicap yourself with a bad, old, or dull bread knife. Because bread knives are serrated, they'll still cut for years after they're past their prime. I thought I had a pretty good bread knife, until one day I picked up a cheap offset bread knife made by Victorinox that had pretty good reviews on Amazon. Here's a link. If you have any question about the quality of your bread knife, get one of these. $25 well-spent. 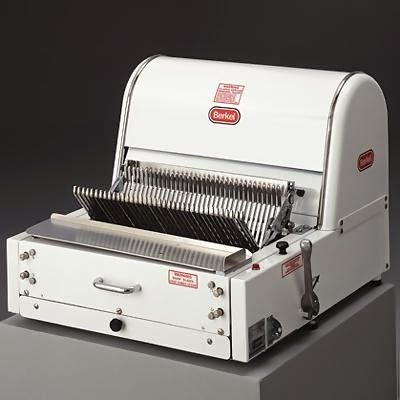 Like most professional baking equipment, these things are obscenely expensive new; in the neighborhood of $5,000. Also like much professional baking equipment, these things can be had for a fraction (in my case, less than 1/10) of the original price. The one we picked up is in considerably worse shape than that one pictured above. Mostly it's just accumulated crumbs and dust. At the same time, it appears to be whole, and it appears to be operational. Frankly, I don't like to even think about what it would take to break this machine. It's incredibly overbuilt. I took a terrifying video of the machine in motion with one of the panels removed. It's on the bed of our truck because it was too heavy for me to get it out of the truck myself. Ha! At the moment, the machine is completely disassembled while I clean every part until it shines. I'm still torn or whether or not to refinish the paint on the frame and the cover, but I think I'll leave it as-is. I once did this same thing with a 1946 John Deere Model A tractor, and the fresh paint was fantastic, so it's going to be hard to resist. We not only have no idea if this machine can accommodate the shape of loaf we're baking; we don't know if the loaves will get shredded to pieces in the machine! These things are really designed to slice sandwich loaves. It will be adventure. More later. 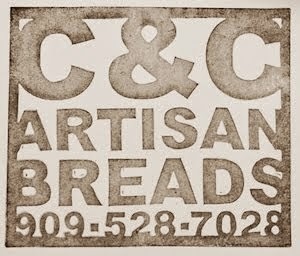 The Bread Share is just around the corner, and while we're planning on delivering primarily the Country Loaf, we'd also like to mix it up occasionally, and it's been an adventure trying to find formulas that will be reliable and a nice diversion from the regular loaf, while still being standard enough that all will enjoy them. To that end, I took some time to reconsider the formula for the standard Country Loaf. I didn't fiddle with the dry ingredients, but I dialed back the hydration a tiny bit. This is contrary to popular wisdom, since wetter is better, in general. But I like the tall loaves that you can get with a slightly stiffer dough. The loaves came out well and the oven spring was great. The nice oven spring was accompanied by some attractive gringe, and I think I'll stick with this slash pattern for the Country Loaf. 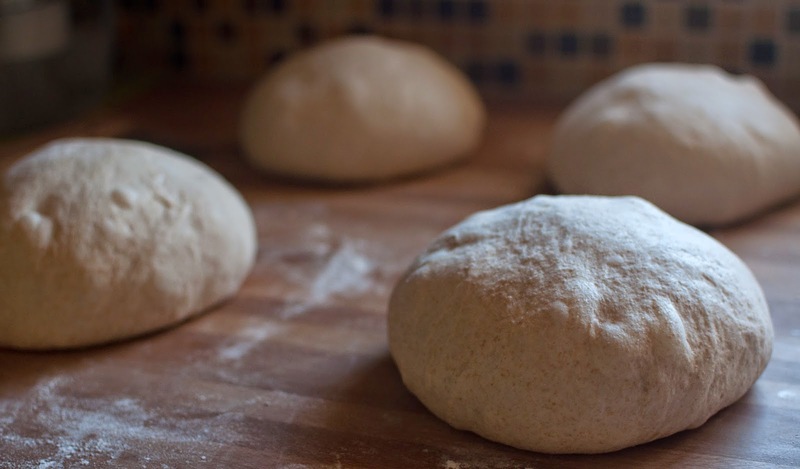 The bread must be slashed (or baked "seam side" up) to allow the loaf to expand in the oven. Aside from that another practical consideration is an easy means of identifying what sort of loaf you have. 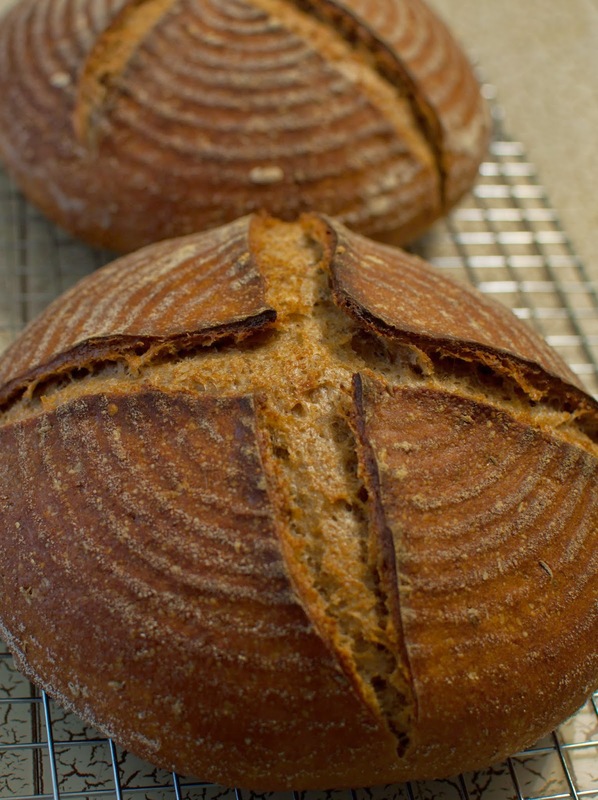 If you have five different boules, the slash pattern can tell you which is rye, whole wheat, etc. There's artistic consideration too, as some slashes are just pretty. I used to make a lot of simple white sourdough bread. 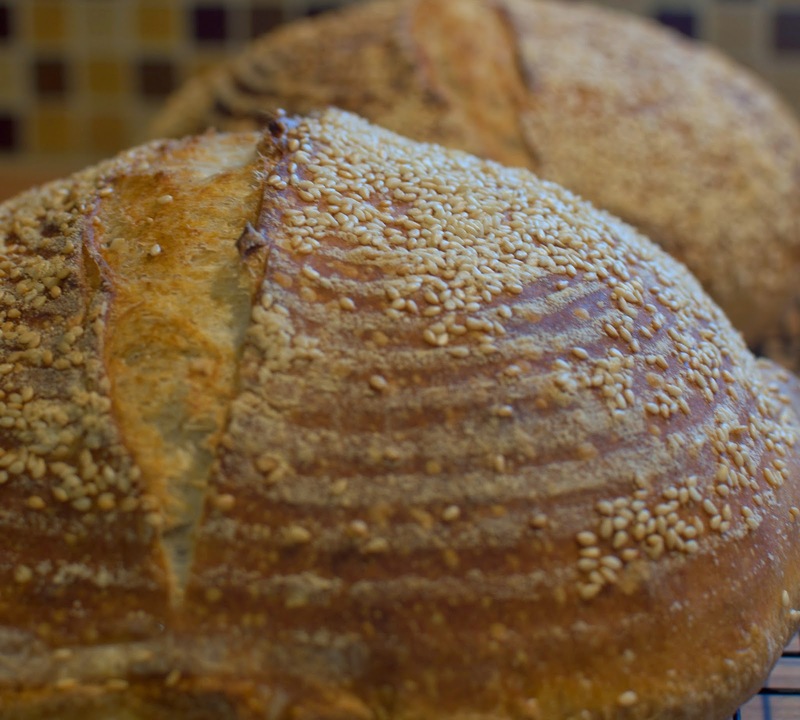 For about a year, I've been trying to get to a milder levain and I've discovered that getting the sour flavor I used to get so easily has proved elusive. Here's our latest attempt at a traditional mostly-white flour (there's a little whole wheat and a tiny bit of whole rye) sourdough loaf. It was only mildly sour, but a nice loaf nonetheless. 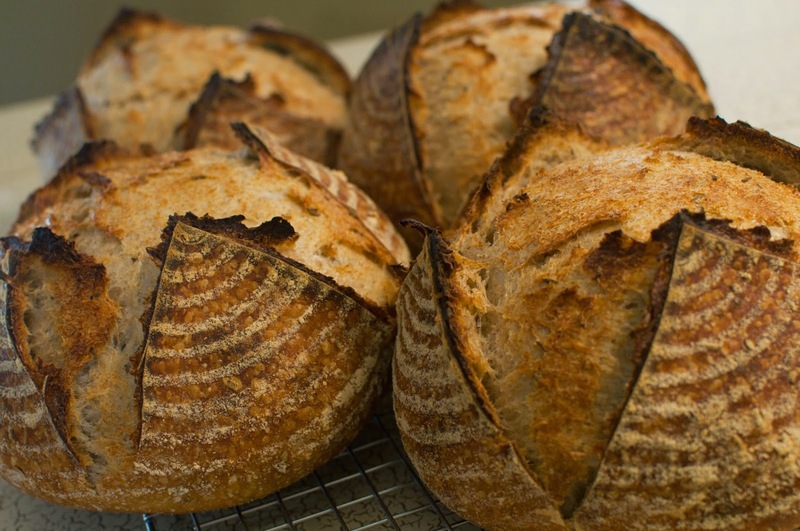 There's a lot of ways that bakers achieve "San Francisco" sourdough flavor. Most of it involves manipulating time and temperature to provide conditions that favor the production of acetic acids by the bacteria in the sourdough culture. Oddly, there's a lot of conflicting information about the best way to do this reliably. 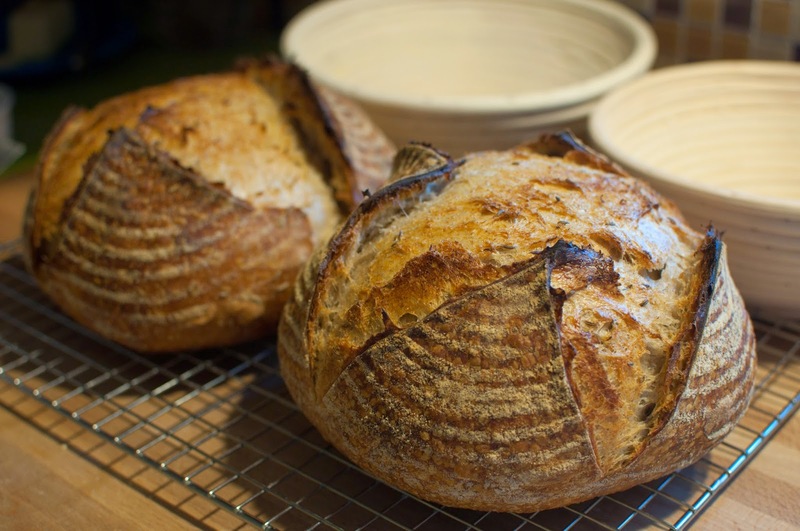 While much of baking (especially maintaining a natural levain) is science, much of that science is still not well researched, and bakers tend to rely on "art" to some extent. Reading the forums where these things are discussed is both revelatory and exasperating. When Cam and I were in Seattle, we went out of our way to stop in at Macrina, a critically acclaimed operation both locally and nationally. 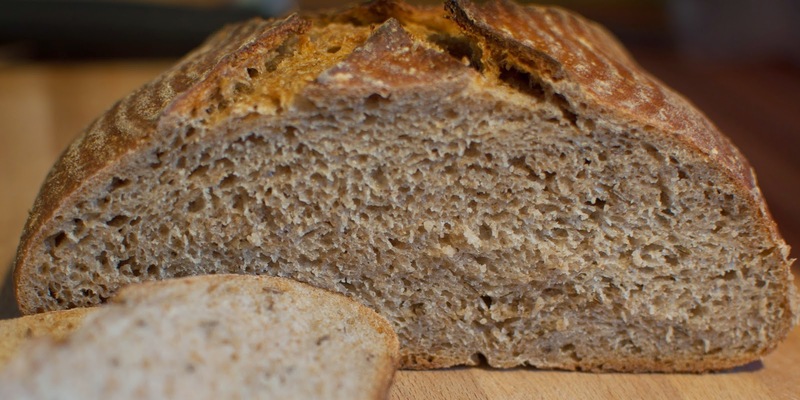 We wanted to try a couple of their most popular loaves, and one of those was their potato bread. It was delicious, and the crumb was remarkably smooth and fine. I assume the it was a commercial yeast leavened bread, with probably a bit of natural levain for flavor. I wanted to see what would happen if a similar loaf was made with 100% natural levain. I adapted a formula from Hamelman's Bread that called for only commercial yeast, and baked a couple of fendu loaves. They came out wonderful! The potatoes were yukon gold potatoes from Jacinto Farms, which means they were grown within five miles of Redlands. The roasted potatoes are mashed, skin and all, and mixed with a nice blend of white and whole wheat flours. 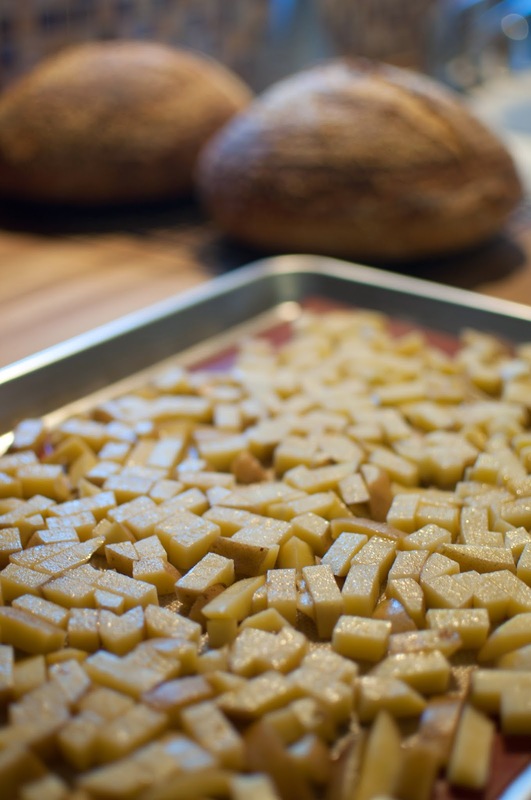 The fendu loaf is shaped as a boule, then instead of slashing the loaf before baking, a rolling pin is pressed into the center of the boule before it is dropped into a banneton for final proofing. I like the effect. 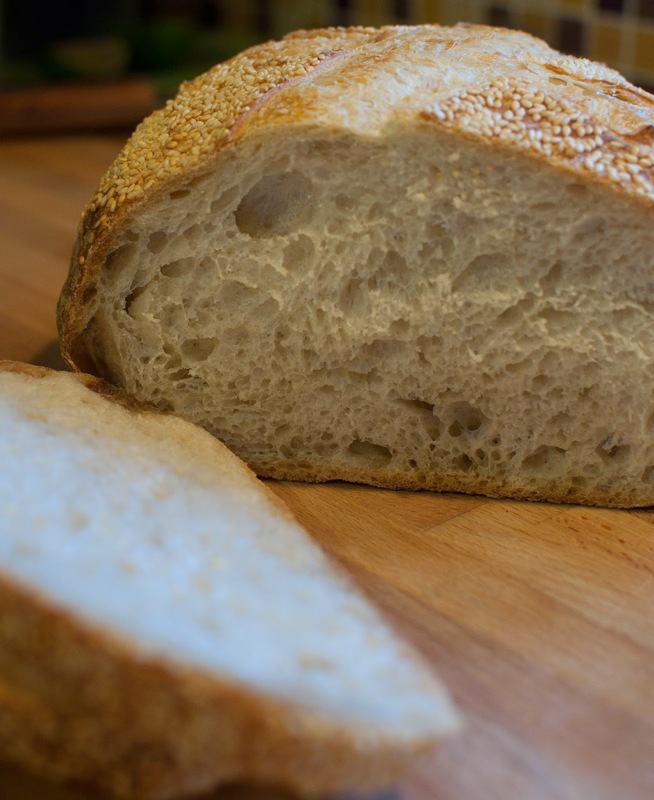 The crumb, while more pocketed and not a lot like the loaf we had in Seattle, is a delight! Soft, slightly chewy, and just a hint of sour. Aside from the flecks of potato skin, you'd not know there is potato in this bread. The crust is light and just slightly toothy. I'm already a big fan of this loaf. Since a lot of folks are going to be wondering what to do with their nearly-two-pound loaf of bread next week, I think I'll post later in the week with some advice on preserving what doesn't get eaten in the first couple of days. Enter your Email address here if you'd like to be notified of new posts!